Marketing - Entities engaged in the marketing of pesticides (excluding hygienic pesticide) shall obtain pesticide marketing license from the competent agricultural department at county level. The Decree has entered into force on 1 Jun 2017. It redefines pesticides as substance or mixtures used to “prevent and control” harmful organisms and establishes a 3 element approval system: each product produced by different producers, companies engaged in manufacturing and processing of pesticide and marketing entities of agricultural pesticides and hygienic insecticides. The Decree specifies competent authorities, general administrative procedures, validity, renewal and supervision of these registration/license. 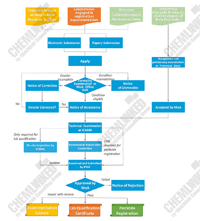 MoA Order 3 of 2017 -"Administrative Measures for the Registration of Pesticides"
Order 3 provides the administrative procedures of pesticide registration, including the qualification of applicant, general technical requirements of product, competent authorities, timeline, file acceptance, validity, renewal, data review and decision of pesticide registration. MoA Order 4 of 2017- "Administrative Measures for the Production License of Pesticides"
Indigenous producers involved in TC/TK manufacturing, processing and sub-packing of pesticide formulation are obligated to obtain a pesticide production license. The regulation specifies the general entry criterion, application material, accepting and issuing authorities, timeline and OEM production of production license. MoA Order 5 of 2017- "Administrative Measures for the Marketing License of Pesticides"
Pesticide sales stores should obtain a pesticide marketing license. The personal qualification, area layout, computer management system, application material and administrative formalities of marketing license are specified in this regulation. MoA Order 6 of 2017- "Administrative Measures for the Experimentation of Pesticide Registration"
MoA Order 7 of 2017-"Administrative Measures for the Labels and Manuals of Pesticides"
The regulation specified the information, content layout, making, use and amendment of pesticide labels and manuals. The Catalogue lists 32 active ingredients identified as restricted pesticides. Pesticides containing this active ingredients are subject to additional labeling requirements and “designation marketing management”. The document further specifies the composition and formation of application material, process, scope and conclusion of the inspection. 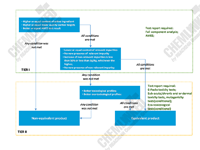 In the annexes, the Rules details the critical point, criterion, method and report template of inspection and as well as the production equipment required for each type of TCs and formulations. MoA Announcement 2569-"Data Requirements on Pesticide Registration"
China MoA announcement 2570-"Rules for the Accreditation on Testing Facilities for Pesticide Registration & Good Laboratory Practice for the Experimentation of Pesticide Registration"
Announcement 2570 consists of 2 regulations applicable to laboratories engaged in the regulatory study of pesticide registration: the “Rules for the Accreditation on Testing Facilities for Pesticide Registration” and the “Good Laboratory Practice for the Experimentation of Pesticide Registration”. The former provides the classification, study scope, qualification criterion, application material, documental review and on-site inspection, criterion of testing facilities. The latter specifies GLP principles to be implemented within the laboratory: organization and personnel, quality assurance program, facilities, apparatus, materials and reagent, test system, test item, reference item and sample, standard operation practice, performance of studies, result reporting and archiving. China MoA announcement 2579-"Announcement concerning the Format and Generation of 2D Codes on Pesticide Labels"
The announcement was released under “Administrative Measures for the Labels and Manuals of Pesticides". It specifies the basic information readable from the 2D code of pesticide packages. Indigenous producers and overseas company exporters should apply for pesticide registration prior to their business activities in China and research institutes/individuals of new pesticides may also apply for the registration. In order to ensure data authenticity and effectiveness and safety of experimental activities, MoARA adopt licensing management on experimental study, product registration and laboratory accreditation. 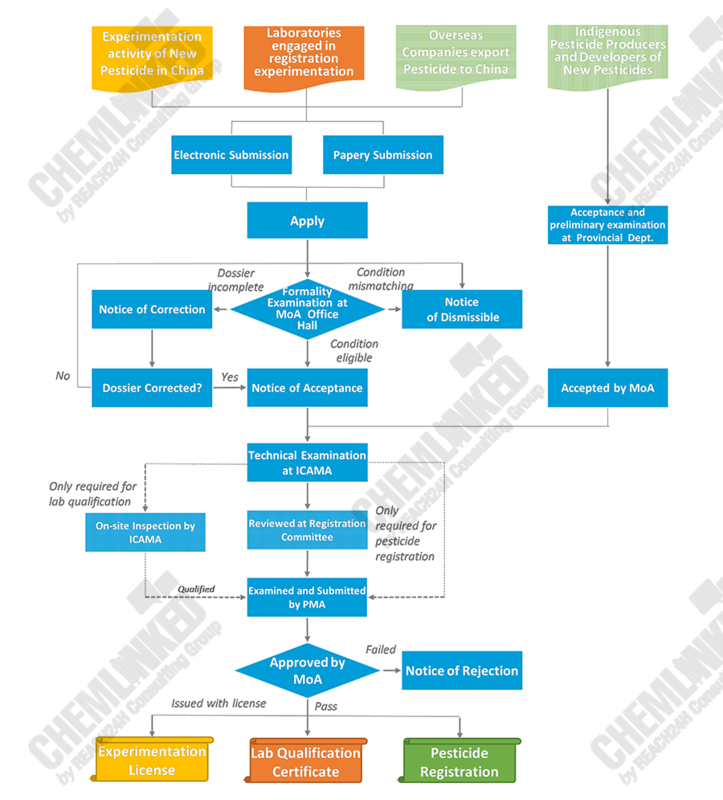 Registration Experimentation License-The applicant should provide administrative information, general technical information and quality inspection test reports of both TC/TK and formulations (for new pesticide, TC/TK and formulation should be submitted together), as well as the proposed target crop/pest, test site and scope, as well as possible risks and available measures for risk mitigation and first aid. The application should be submitted in both online and paper format. ICAMA will undertake technical examination on the application material and present technical comment to the PMA, who will conclude and propose a comprehensive opinion to the Ministry for final approval. Upon the final approval by the MoARA, the applicant will be issued with a license of registration experimentation of new pesticide, which will be valid for 5 years. If the experimentation was performed during the validity period, the license will be granted. Besides, only test reports obtained from qualified testing facilities can be recognized for registration review. The reform has stopped ICAMA from unilaterally accepting OECD GLP report from overseas laboratories until the organization/authorities of these countries signed MAD (mutual/ multilateral acceptance of data) agreement with China. Indigenous laboratories shall comply with the GLP principles and received on-site inspection for operation status of quality assurance system, facilities, equipment and technical capacity and granted with corresponding qualifications. The qualification is valid for 5 years and shall be reapplied 6 months prior to each expiry. 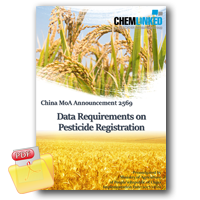 English Translation of China MoA Announcement 2569"Data Requirements on Pesticide Registration"
On 1 Nov 2017, China implemented the “Announcement 2569- Data Requirements on Pesticide Registration”. Applications made after implementation of this announcement have required more test data and have been subject to more stringent criteria than previous regulation. Registration categories of minor amendment to formulation type, new synergist-pesticide and repacking registration were removed and all conditions are categorized into 13 categories. Efficacy-Criteria has been changed from efficacy rating to comprehensive benefit analysis and reports of substitutability and benefit analysis and pest risk assessment are additionally required. Test duration can be reduced from 2 year to 1 year for bio pesticides and other registration categories. Residue-Dietary risk assessment report will be required for food crop use pesticide. The minimal numbers of test sites are also increased for staple crops and vegetables such as rice, wheat, maize, tomato, chili, cabbage, citrus and poems. Metabolism study in plant, animal and envroment, residue storage stability and residue study in processed food are conditionally required for new active ingredient, new formulation type, new content and new combination. Toxicity-Acute neurotoxicity, sub-acute/chronic dermal toxicity, sub-acute/chronic inhalation tests are newly required for TC/TKs. Teratogenicity and carcinogenicity studies are increased from 1 rodent to 2 rodents. Health risk assessment on pesticide applicators and residents are required for field use pesticides and hygienic pesticides respectively. If preliminary assessment suggests unacceptable health risks to human, simulated and field exposure tests would be required. Environmental Impact-Impacts on environmental organisms are stringently evaluated from acute effect to long-term effect and direct impact/indirect impact. For example, fish life-cycle and bioaccumulation study, tests of reproductive toxicity to daphnia magna and chronic toxicity to silkworm are conditionally required for certain pesticide types. Toxicity tests on predatory and parasitic natural enemies, environmental fate test and ecotoxicity study on radiolabeled pesticide metabolic are required from new TC/TK and non-me-too TC/TK. Spicatum toxicity and duckweed growth inhibition test will be required from Herbicide TC/TK against dicotyledon and monocotyledon weeds respectively. Environmental risk assessment report will be required for almost all field and environmental chemical pesticides. If preliminary assessment suggests unacceptable risks to any environmental organisms, additionally test data such as mesocosm, semi-field and field study would be required. In June 2017, China implemented a program to reduce generic pesticide and new approval of me-too registration by 2020 and the new data requirements imposed tighten rules on generic pesticides. Previously, test reports from overseas OECD-GLP labs were acceptable even though China is neither an OECD member nor an adherent to the OECD MAD (Mutual/ multilateral Acceptance of Data) program. 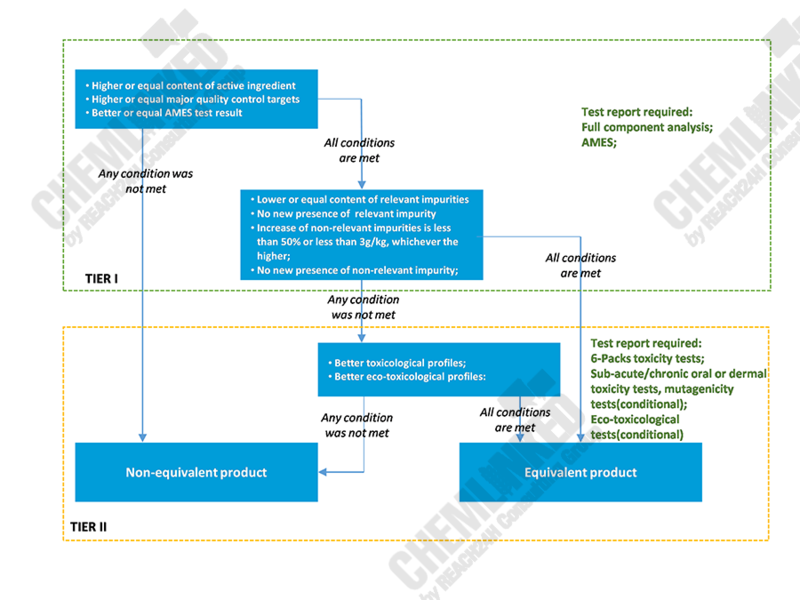 In the new regulations, China has decided to "level the playing field" by adding the new clause: test reports supporting pesticide registration must be issued from a MoARA-designated lab or an oversea lab from a country or organization which have signed a MAD (Mutual/ multilateral Acceptance of Data) agreement with China. International companies are also subject to additional requirements including: plot and large plot efficacy trial, in-crop residue test, in-field exposure test and other studies involved with China-specific organisms must be conducted in China. MoA had issued 2 GLP-related regulations: Good Laboratory Practices for Toxicity Studies of Pesticides (NY/T 718-2003) and Good Laboratory Practices for Physical and Chemical Testing of Pesticides (NY/T 1386-2007), targeting only toxicity and physical& chemical labs. After this legislative reform, these GLP regulations were collective renewed as “Good Laboratory Practice for the Experimentation of Pesticide Registration” and enforce for all study scope including physical chemistry, toxicity, efficacy, residue and environmental fate and impact. Domestic producers and new pesticide developers are allowed to use an OEM producer which has not yet obtained the pesticide registration to process or repack pesticide. Overseas registrant can only use OEM packers. Adherence to national industrial and economic policies are also fully considering during qualification, which includes: "Made in China 2025", “13th Five-Year National Plan on Environmental Improvement (State Council Circular 65 of 2016)”, “Guidance on the Restructuring and Revitalization of Petrochemical Industry (State Council Office Circular 57 of 2016)”, “Policy on Pesticide Industry (Jointly Issued by 4 Ministries in 2010)”, “Catalogue of Outdated Production Capacity, Technology and Product subject to Elimination” and “Inventory of Industries subject to Structural Adjustment” and other pesticide revoked or suspended by MoA/MoARA. Compared with previous labeling requirement, QR code tracking will be mandatorily enforced on each product retail unit, which enable public enquiry on production batch and quality inspection information.